1. 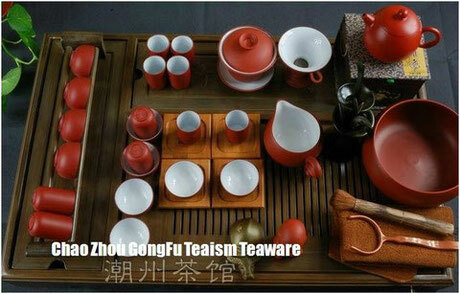 Explain the tea service to the guests. 3. Light the charcoal (traditionally olive pits) in the clay tea stove. 4. Pour the water into the tea kettle (a long-handled, clay teapot). 5. Bring the water to a boil, using a feather fan on the coals to sufficiently heat them. 6. Warm the serving teapot by pouring the hot water in and over it. 7. Warm the tea cups in the same fashion. 8. Place the tea to be infused on a piece of white paper. 9. Use the paper to guide the tea leaves into the teapot. 10. Wash the tea leaves with hot water, pouring this first infusion over the tea cups and teapot (to keep them warm). Be sure to then discard this fist infusion by dumping all tea in the cups and teapot out on the tea table. 11. Pour hot water into the teapot a second time (this time to be consumed), being sure to keep the kettle 20 centimeters (8 inches) above the teapot. 12. Use the teapot lid to smooth out any bubbles on the surface of the tea in the teapot. 13. Put the lid back on the teapot and warm the teapot again by pouring hot water over it. 14. 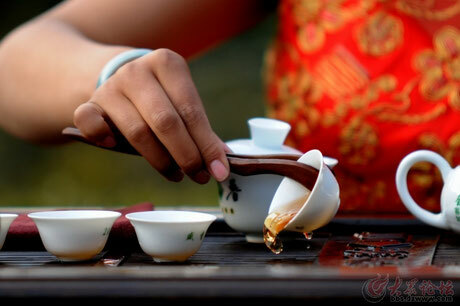 Warm and wash the cups again by pouring hot water over them and rolling one inside another using tea tongs, being sure to get all the edges submerged in the hot water. Cup washing should only take seconds to perform. 15. Pour the tea from the teapot into the first cup, being sure to keep the teapot 4-5 centimeters (1.5-2 inches) above the cups. 16. 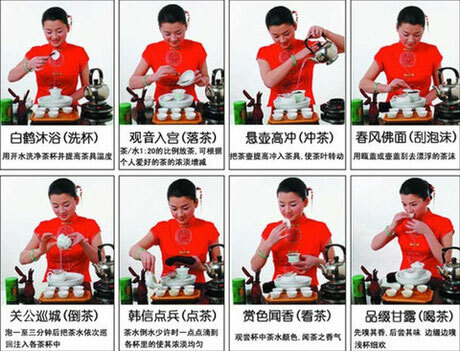 Quickly move the teapot to the second and third cups, being sure to pour the tea evenly into every cup. 17. Make sure every drop is dripped into the cups. 18. Serve the guests by gently moving a tea cup in front of each one and politely asking them to drink. Extra guests beyond three must wait for the next round, and the same three cups are reused. 19. Before sipping, guests should first smell the tea. Hosts will also often offer the teapot lid for guests to smell. Smelling is very important because 90% of the taste of tea is in the smell. 20. Everyone is to take sips of the tea and savor the taste. Connoisseurs often loudly slurp the tea and swish it around in their cheeks to be sure all taste buds are engaged. 21. Everyone should smell their empty cup after drinking. 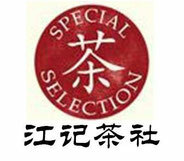 The teapot or gaiwan lid will often be offered as well.